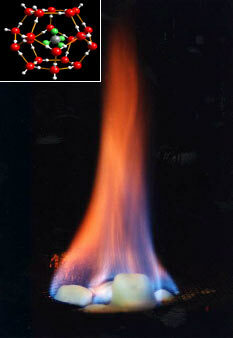 Methane Hydrates, energy solution, bombshell or just a beautiful fire? Recently I read in a sceptic blog a post about methane hydrates. They are a huge potential source of methane or natural gas in the bottom of the sea. Their extraction and use as fuel it is not straightforward nor cheap, but some researchers claim they have found a way to do it economically. This wonderful “burning fire” promises a new oil era, a longer one to continue with fossil fuel energy. It is interesting for me to see the fascination that some feel for fossil fuels or anything that burns. Because in order to find some new energy source they could explain the new possibilities of nanotechnologies in this field or advances in biofuels. All those researches could become real or not , the same as methane hydrates. Yet they have a big difference, they do not emit CO2 and would help us reduce climate change. And all this if due to climate change some of those methane hydrates do not start to melt just by the higher temperature, something quite dangerous as methane is a powerful greenhouse gas and it would ignite a strong positive feedback. It seems unlikely, fortunately. but it they want to get it all for sure they will have to be fast.